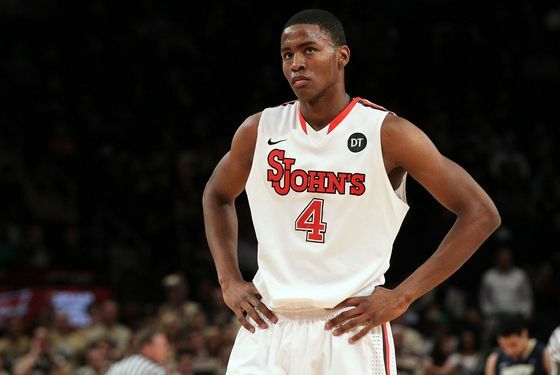 Last season was a particularly unmemorable one for the St. John's Red Storm. They went 13-19, were dropped in the first round of the Big East tournament, lost a few recruits because of academic issues and missed coach Steve Lavin most of the season as he received cancer treatment. But, as it turned out, there were real NBA gems just sitting around the roster. Assistant coach Mike Dunlap was just hired by the Charlotte Bobcats to be their head coach, and Moe Harkless, the team's leading scorer and one of the few big recruits to play for the school, is gonna be drafted tonight. Probably in the first round. Precisely where Harkless will go is a matter of much debate — the draft hasn't happened yet, after all — but suffice it to say, he'll go long long long before the Knicks or Nets pick in the second round. Harkless is a 6-foot-9 swingman with legitimate length and serious hops; issues with his shot and his effort are easily passed over when you're as athletic as Harkless. It'll be a cool night for him, too; his mother works at an Applebee's in south Jamaica and lives with six other people in their home. At least until tonight she does. So, where's he going? Chad Ford has him going with the eighteenth pick to Houston, though there are widespread rumors that the Rockets will trade that pick. DraftExpress also has him to the Rockets, but at the No. 16 pick. (NBADraft.net has him in the same spot.) SheridanHoops? No. 19 to Orlando. Somewhat worrisome: The Hoops Report has him falling all the way to the second round to Cleveland, which might be a perfect fit for him, actually.